After years of delays, the film version of Bill Bryson’s bestselling 1998 novel has finally crawled into theaters, providing millions of moviegoers the opportunity to see the grandeur of the Appalachian Trail on the big screen. Yet while the film tells the story of a thru-hike attempt gone awry, that doesn’t mean that it gets all of the facts straight. Whether due to dramatic license or simply getting it wrong, there are more than a few details in the film that will make A.T. thru-hikers scoff into their oatmeal. This isn’t an indictment of the movie itself—none of us at Appalachian Trials claim to be movie critics. We just want to set the record straight when it comes to something we do know: the ins-and-outs of being a thru-hiker. We don’t want any aspiring thru-hikers getting the wrong idea before heading off on their own adventures. Heads up: if you’re sensitive to movie spoilers, we’ll be discussing almost every aspect of the film here. The Dangers of the A.T. The film: After Bryson has announced his plan to hike the A.T. and begins gathering his gear, he returns home to find that his wife has oh-so-helpfully compiled a stack of articles and books reporting the dangers he will undoubtedly encounter. With grave seriousness, the camera lingers on headlines about bear attacks, decomposing bodies, and ritualistic sacrifices carried out by cultists with a kink for hiker blood. Bryson studies up on the ways he might perish during his A.T. adventure. Image courtesy of Route One Films and Wildwood Enterprises. Most of the dangers on the A.T. can be avoided entirely with adequate preparation, and the National Park Service has provided an excellent checklist to help maximize your safety on and enjoyment of the trail. The film: In an attempt to convince his father to abandon his ideas of thru-hiking, Bryson’s son states that “less than 10% of hikers” actually succeed in completing their hikes. The reality: The number of successful thru-hikes has drastically increased over just the past decade, with 26% of northbound hikes, 29% of southbound hikes, and a whopping 57% of flip-flop hikes being successful in 2014. The film: After experiencing the terror of the aforementioned list, Bryson’s wife Catherine leaves him a short-but-decisive ultimatum: “You are not doing this alone.” Bryson agrees that such an endeavor on his own would be a death wish, so he calls everyone he knows that might share in his adventure/keep the boogeymen away. The reality: Most thru-hikers start out by themselves, though groups often form quite quickly. Those who seek solitude can find it easily, but if you fear being by yourself, take heed—close to 3,000 aspiring thru-hikers were on the trail in 2014, and those numbers have been steadily rising every year. The film: Pretty much everyone in the film, including Bryson and Katz, appears to have a social disorder of some kind, making them oblivious to others’ emotions. This makes an A.T. thru-hike seem to be more about dodging other people than it is about enjoying everything the trail has to offer, including your fellow hikers. Mary Ellen (played by Kristen Schaal) lectures Katz (Nick Nolte) and Bryson (Robert Redford) on how to be a “real” hiker. Image courtesy of IMDB. The reality: While you can always find “that guy” when the crowd gets big enough, the majority of people on the A.T. are affable and thrilled to be sharing one of their passions with fellow outdoor enthusiasts. I can count on one finger the number of people who went out of their way to inform me that my gear/hiking style/food consumption/hairstyle wasn’t up to their standards. Everyone else remembered one simple rule: hike your own hike, which means you should complete your journey in a way that is most satisfying to you without taking away from the enjoyment of those around you. The film: Whenever Bryson and Katz step off of the trail in the South, they inevitably encounter one of the South’s premier stereotypes: a 300-pound waitress in Georgia, another 300-pound adulteress and her similarly-sized redneck husband in Virginia (sensing a theme here? ), and a restaurant full of Civil War reenactors adorned in Confederate soldier uniforms are just a few examples. The reality: While examples of these walking stereotypes do exist (source: I live in Georgia), most people in the south are remarkably unremarkable—aside from the Southern “twang” and the tendency to refer to every soft drink as a “Coke,” of course. The film: Bryson sports a wide variety of shirts, pants, pajamas, and even a bathrobe at various points throughout his hike, and they are almost always clean, wrinkle-free, and with designer labels clearly in view. The majority of his shirts also seemed to be made from cotton, usually a stylish flannel button-up. Ruggedly stylish? Yes, but a day in the rain with cotton clothes might convince you to ditch the fashion sense. Image courtesy of Route One Films and Wildwood Enterprises. The reality: The amount of clothes Bryson carried would have likely added over 15 pounds to his pack weight—and that isn’t even including winter base layers, puffy jackets, and rain coats. The majority of thru-hikers I met carried two sets of clothes: a dirty pair for hiking, and a cleaner/dryer pair for camp. By the time a northbounder reaches Virginia, neither set will likely be in very good condition anymore. And if you’re thinking about carrying cotton clothes, don’t: cotton is almost useless when it gets wet (read: you will get wet) and takes forever to dry. Nothing says “inexperienced hiker” more clearly than someone coming up the trail in blue jeans and a flannel shirt, no matter how rugged you think it makes you look. The film: Before reaching the Smoky Mountains, Bryson and Katz meet up with a “southbounder,” the term for a thru-hiker heading—you guessed it—from north to south. The reality: It is highly unlikely that a northbound hiker starting in April would run into any southbound thru-hikers before at least the halfway point—most southbounders start sometime between May and August. Judging by the hiker’s clean clothes and lack of the telltale thru-hiker scruff/deterioration, my guess is that this hiker is actually a misnamed section hiker. There are No Grizzly Bears on the A.T. The film: While camping in Shenandoah National Park, Bryson and Katz are awoken in the middle of the night when two bears invade their campsite (note: Bryson and Katz apparently just left all of their garbage and cooking equipment out on the ground, a big no-no when it comes to Leave No Trace Principles). The know-it-all Bryson quickly identifies these bears as “grizzlies” before he and Katz scare them away by shaking their tents and screaming. While there are plenty of black bears along the entire length of the Appalachian Trail, your chances of grizzlies invading your camp are nonexistent. Image courtesy of Route One Films and Wildwood Enterprises. The reality: Unless you find one in a zoo, your probability of finding a grizzly bear on the A.T. rests somewhere between 0% and not a chance. Black bears, on the other hand, are active along the entire length of the A.T. In order to minimize your chances of a bear encounter—and what to do should it happen—check out this article for some helpful hints. The film: While Bryson is on the trail for at least two months, we only see him contacting his wife once via a hotel landline. Later he comments on how much he misses his wife, indicating that he has not spoken with her since beginning his endeavor. Couldn’t a successful writer afford, I don’t know, a Nokia flip phone or something? The reality: This detail was likely overlooked when the screenwriter adapted the novel, which was published back in 1998—a time when cell phones weren’t an everyday part of life, and mobile signal was virtually nonexistent in the Appalachians. That is absolutely not an issue in the modern era, when it is more surprising when someone doesn’t have a mobile phone somewhere in their pack. And aside from a few secluded areas—northern Maine, the Smoky Mountains, and a few others—phone reception is present for almost the entire length of the trail. If you don’t contact home during your thru-hike, it won’t be because you can’t: it will be because you don’t want to. That puts a new spin on Bryson’s character, doesn’t it? The film: Sometime after exiting Shenandoah, Bryson and Katz stumble upon McAfee Knob, the most photographed location on the entire trail. The reality: McAfee Knob is over 150 miles south of Shenandoah National Park’s border. The filmmakers seemed to have relocated it for dramatic impact, though those familiar with this landmark will probably have a good laugh—that would have meant that Bryson and Katz had accidentally been hiking south for around two weeks. The film: Somewhere in northern Virginia, the A.T. skirts the edge of a perilous cliff with a sheer drop-off of around 100 feet or more. Bryson and Katz have to hug the cliffside in order to keep from falling to instant death in the ravine. They do eventually (and predictably) fall off of the cliff, but land on a smaller outcropping approximately 20 feet below them. Stranded, they spend the next day calling for help and pondering life’s cruelties. The reality: While there are certainly several steep drops on the A.T.—the majority of which being in the White Mountains and Maine—I can’t think of any that were as openly perilous as the one presented here. At the very least, there was nothing like this on the A.T. in northern Virginia, where the hills become much lower and rounder until the trail meanders into New England. This cliff was placed here for dramatic purposes, and much of it was created via special effects (as you can see in the following image). (Top) Near the end of the film, Bryson and Katz follow the A.T. in Virginia along a (nonexistent) cliffside with a sheer dropoff. 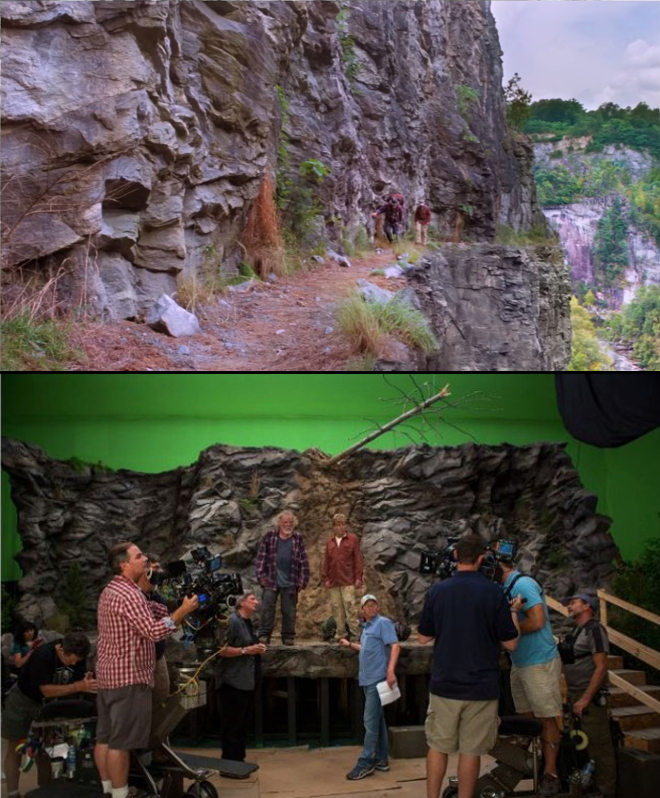 (Bottom) This cliff was primarily created using computer effects, with a small set being used during filming. Images courtesy of Route One Films and Wildwood Enterprises. The film: Bryson and Katz eventually abandon their hopes of thru-hiking the trail due to complete physical and mental exhaustion, defeated by the A.T.’s meandering journey over hundreds of “Pointless Ups and Downs” (affectionately known by thru-hikers as “PUDS”). The excuses abound: “I’m too old!” “You’re too fat!” The film seems to argue that the A.T. just isn’t accessible to those who are over the age of 35 and haven’t spent years building up their hiking muscles. Bryson also admits that he misses his home and family—which is appropriate, since he only tried calling home once. The reality: Anyone who says that the A.T. is easy suffers from a case of disillusionment the size of Mount Washington. Yet there is an old adage among A.T. hikers: if you can physically hike the first 30 miles, you can hike the entire trail. And for those of you who still think an A.T. thru-hike is a youngster’s game, try telling that to Lee Berry, who completed his thru-hike in 2004 at the age of 81! But the film did nail one important fact: the majority of potential thru-hikers end their journey prematurely not because of physical wear and tear: it’s because the trail is a mental marathon. Many hikers start the trail with visions of sunny skies, stunning vistas, and fireside choruses of “Kumbaya” every night before a comfy nap under the stars. And while those moments will almost certainly occur (maybe not the “Kumbaya” part), these hikers don’t take into account the amount of frustration, pain, and boredom that will become commonplace throughout the hike. And then there’s the mud, sharp rocks, slips and falls, bumps and scrapes, mosquitos, spiders, sweat-soaked clothes, sore muscles, chafing, blisters, never-ending hunger, days—sometimes weeks—of constant rain, the “green tunnel effect,” eating oatmeal for the fiftieth time, homesickness, waiting for hours for a hitch into town, and the smell (my god, the smell!). Many people can take these discomforts for a while. But when the weeks turn into months and you’re still getting blisters on your big toe (plus a little of everything else listed above), the sane person’s mind may start to wonder: why am I out here again? I have family, friends, and indoor plumbing waiting for me, and they’re all just a phone call and a bus trip away. That temptation is why most hikers leave behind their thru-hikes, Bryson and Katz included. And I am willing to bet that every aspiring thru-hiker experiences those thoughts at one point or another. I know I did, on a day when the temperatures dropped below zero, three feet of snow had fallen overnight, and I had just slid down a mountainside into a tree trunk. So why did I, and hundreds of other successful thru-hikers, keep going? It’s all about your frame of mind. Of course, keeping a positive frame of mind during your tenth thunderstorm in five days may be a challenge, so for tips on training your mind for a thru-hike, check out Zach Davis’ book Appalachian Trials (where have I heard that title before?). Believe it or Not, A Thru-Hike is Actually Fun! The film: Bryson and Katz grumble and moan their way all the way to Northern Virginia, never seeming to enjoy any of the time they actually spend in the woods. Both of them seem to be hiking the trail for a single reason: to prove that they can. Bryson and Katz make an A.T. thru-hike look like a miserable experience, which is mostly due to their attitude toward the trail itself. Image courtesy of Dallas Observer. The reality: Yes, hiking the A.T. is a physically and mentally exhausting endeavor, but the rewards are equally worth the effort you expend. You will encounter unparalleled beauty, develop lifelong friendships, and push yourself beyond any limits you thought you had. As mentioned before, it’s all about your frame of mind. You must expect the hardships along with the pleasures, the ugliness along with the beauty, the failures along with the triumphs. If you treat the A.T. as an obstacle to conquer, you may only be focusing on the next challenge rather than the experiences around you. That’s a recipe for burn-out. Yet if you remember one simple fact—for every defeat, there will be a victory—you may just find yourself standing by that last white blaze. What do you think? Did you notice any other details that the movie got absolutely right or skull-crushingly wrong? Did it live up to your expectations, or would you rather bury it in the woods with an orange poop trowel? Let us know in the comments below. Not so much an error as much as a “huh?” They carried their trekking poles on their packs throughout the entire movie. You’d think that Katz, at least, would have found them handy at some point. That was the first thing I observed…. I appreciated the movie simply because it’s a movie about the AT but I was disappointed that so many details were dismissed. Some of the best movies are ones where the little details are accounted for. It’s what makes it believable. Another detail was that I’m pretty sure Kelty had not fielded the Kelty Trekker 65 External Frame Pack in 1998 which is what Katz was carrying. They could have also put just a little weight in the packs as they were slinging them around like there were air bags in them. It’s definitely a movie to see for sheer fun, just don’t go expecting accuracy. A lot of the gear was wrong. But I don’t think they said the movies was set in 1998. Greg, I am going to pick on you, because I have too many choices, but please feel free to pass this on. I am a legally blind individual who has probably logged over 5000 miles on the A.T. since 1999, mostly in large sections at a time. I have gone from Katahdin to Harpers Ferry, gone from Springer Mountain to HF, been through Virginia five times, and have done other various repeat sections. So , to say “been there, done that” would suffice. I am not the final authority on hiking the A.T., but I think I can render a qualified opinion. First of all, I think that there are way too many people who are taking exceptions with inaccuracies that the movie presents. This is the same type of flak that happened when Bryson came out with book. FOLKS, THIS IS A FLIPPIN’ MOVIE! YOU KNOW – ENTERTAINMENT? Big “@##!$” deal if they were inaccurate with things. Personally, I thoroughly enjoyed the movie! I thought Nolte made a great Katz! The movie did have educational value: it taught me a new word – “pantyologist”! I also found the soundtrack to be very good. And regarding the omissions, hey, there is only so much you can do in a two hour time frame. The movie, and the book for that matter, was never meant to be a documentary or “how to” guide. If you want that, go to the ATC! They have many fine publications that will satisfy your “purists” minds and attitudes! I’ll get off my soapbox now. Sorry if I was rambling, but I felt this issue needed to be addressed. Thanks for putting up with me. Rock On! The book made me angry and I think I’ll pass on the movie too. I might take a hike instead. Get a “@##$! !” life, mister. IT WAS A FLIPPIN’ MOVIE, YOU KNOW – ENTERTAINMENT? Big deal if there were inaccuracies or omissions! Just like the book, I found it highly enjoyable! Come to think of it, you may have anger issues that need to be dealt with. A 2,000 mile hike on the A.T., with beer and pizza stops in every town along the way, may be in order. Rock On! This is a movie..not a documentary. I am assuming it was made to entertain and make millions of people who will never take a step on the AT aware that there is an AT. I am sure the AT, to some, is like living on a desert island is to others…a goal that might not ever been achieved for whatever reason. I found the book entertaining and fun. My sons and I have been section hiking the AT for years. We don’t approach it as some vision quest or searching for our chi, or some interstellar connection…as the book says, we enjoy our “walk in the woods”. My sons are grown with their own children but we still go out and enjoy our 2-3 week adventures. As we say in the news business, any exposure is good exposure. To have Robert Redford and Nick Nolte chose to be a part of the movie, says something about the content. I am pretty sure Robert Redford didn’t do it for the money. Want a documentary, go to National Geographic…want to laugh and enjoy a movie, see the movie. The movie was a wonderful movie. It hit on many points and missed on a few, that really did not take away from the enjoyment of the movie. I loved Redford and Nolte “Bryson!!”. It was a movie about two friends reconnecting on the beauty of our American backcountry. If this movie makes more people aware of nature and how it must be preserved then it was a huge success. The ATC does great work and the AT is a beautiful trail. My thru-hike date is set for March 15 2028. Then my son will be grown up and we can go together. Hike your own hike my friends! Great article! Thanks for those who may consider such an endeavor. If they’re making it sound tough and miserable then more power to them! There’s going to be enough new folks on the trail because of this movie, as it is. Scaring some off can’t be a bad thing! I thought it was mainly an old guy buddy movie. Don’t don’t see it inspiring people like the book. my mate’s mother makes $98 consistently on the tablet………After earning an average of 19952 Dollars monthly,I’m finally getting 98 Dollars an hour,just working 4-5 hours daily online….It’s time to take some action and you can join it too.It is simple,dedicated and easy way to get rich.Three weeks from now you will wishyou have started today – I promise!….HERE I STARTED-TAKE A LOOK AT…..ssm…..
Yeah, for God’s sake let’s keep the trail for ourselves, right? Never have understood folks who want entry into Paradise as long as they are able blow up the bridge behind them to keep everyone behind them out. I am not quite convinced that it is going scare that many people off. Yes, it is tough, as both you and I have probably experienced, but it is really not all that bad. Just like anything else in life, it takes some getting used to. The human body will adapt to a certain lifestyle, as long as there is an attitude to go along with it. As for the “newbies” who may be inspired to hike, well, I think that maybe they are somewhat logical and sensible for the most part, and they will think and plan accordingly. The more, the merrier! Rock On! It’s not a documentary! Have you ever seen a John Wayne movie? Does any western Cowboys and Indians movie portray the real west? Does Star Trek represent today’s space travel? Go take a Hike! Well, I went to see the movie and also read the book. The movie theater was quite empty and me and my 3 other companions were over 55 and the youngest in the theater. The AT conservatory need not worry about increased activity on the trail due to this movie unless you consider seniors a threat. I noticed that, too. The audience at the show I attended was decidedly geriatric. More like long-term Redford fans than outdoorsy types. I agree, surprised at the age group. At 61 I felt we might be close to the oldest in the movie. I saw people who came in with walkers and canes, barely able to make it up the stairs. Getting ready with a friend (48) for a NB in March and not reading the book I was somewhat disappointed. Funny but I guess I was looking for more info. Several of us “Seniors,” were inspired , reinsured, including to donate to the maintenance of the AT. I thought it was a good thing and one purpose of the movie. Are you so young as to not be aware you will be “one” some day. Will you consider yourself a threat? I’d finish the book if I were you. It’s not a book telling the tale of a thru hike. It’s an amusing well written book half of which is about 2 guys walking in the woods and half is background info about parts of the trail. I read the book back when it first came out and thoroughly enjoyed it. The book was true to Brysons experience and worth reading as it covers much of what you mention is wrong with the movie. Having worked in the film industry I can tell you that once rights have been sold, the industry takes over and changes multiple items to fit the story into a mold (formula). Movies rarely stay true to form. I would encourage inexperienced through hikers to read Brysons book as it is JAM PACKED with information about not preparing and the trials that come about as a result of that. Bryson is many things but he is not without useful information as he tells his stories. Movies on the other hand are entertainment and they make it clear (based on a book) does not mean true to the details. The book made me LOVE the trail and want to do what I could to ensure its future. That is what Bryson did with his story. Too bad Bryson didn’t have more editorial control over the movie. If you haven’t read his book you think he’s a real dumbass after seeing the movie. You got the bear section wrong. Redford first advised Nolte to play dead, but then corrected himself: “No, that’s for Grizzlies.” His subsequent advice to look big and be loud clearly doesn’t apply to Grizzlies. SOoo… if they’re not grizzlies what kind of bears were they supposed to be? They must be grizzlie actors playing the role of black bears. Lol. …but still a great post! I enjoyed it (and the film). I can’t say what Bryson’s experience was because it was his own but he somehow completely missed the community part of the trail. I read another of his books and he is an entertaining writer but it almost seems like he has a preconceived story that he is going to tell rather than the actual reality story. Of course his story is hilarious. The movie places Neels Gap somewhere on the Approach Trail. They come to the plaque at Springer after Mountain Crossings. Lighten up, hiker community – its not intended to be a documentary or a training video – it’s entertainment. The story’s evolved from his experience on trail to his manuscript to the finished book to the screenplay to the film. Hear you, and others who say similar. But taking a little care with the details would have made this both entertaining and informative. They spent 8 million to make the movie, would it have killed them to hire a thru-hiker consultant? You got it wrong about the Grizzlies” he said “no. That’s Grizzlies.” Indicating that he thought that playing dead was what you do for confronting Grizzlies but he realized that they were black bears. Of corse the whole story is silly cause it was about people who didn’t know better. Also about the southbounder he might not have meant a southbounder but more a hiker headed south, given the benefit of the doubt. They could have heard that buzz word somewhere and thought it could have applied to all hikers headed south. But, it’s actually grizzlies that are pictured, not black bears. So, even if you excuse the dialog, you can’t excuse the image. They were grizzlie actors playing the parts of black bears. I just wanted to point out that the book is not a novel, but a memoir. Good article, though. As luck would have it, I just finished Bryson’s book a couple months before this movie was released. I was disappointed he didn’t finish the trail, but I still enjoyed the book. The film’s ending when they were stranded on the ledge was completely fictional and I thought the real story was much more interesting. At 54 & 53, my husband and I were the youngest people in the theatre but the audience seemed to love it and laughed often (so did we). My biggest disappointment was that the actors cast were so much older than I imagined. 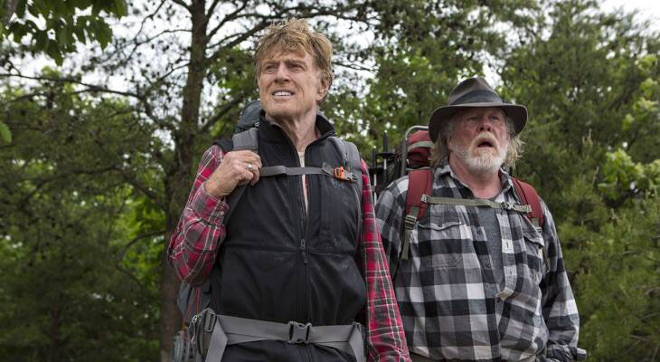 Redford is 79 and Nolte is 74 and I don’t think Bryson and Katz were even 50 when they hiked it. The trees were in full leaf right off the bat. Genetic Disorders – Recessive Genetic Disorders…LOL We’re good at appearing normal in public. Great review, Teach. I too have read the book, twice: Once when it came out, before I started section hiking in earnest, and once with my book group: We actually read it and Wild, by Cheryl Strayed, at the same time. As the only “real” AT hiker in the group, I answered a lot of questions, got to do an expensive show and tell of my gear and even provided some dehydrated snacks for their education. It was fun, but I do not think any of them will be joining me any time soon. BTW, we met at Upper Goose Pond last June. You were hiking with Birdman, and I enjoyed meeting both of you! My trail name is Quill. A BATHROBE? REALLY? …their packs were clearly only filled with bubble wrap! Most packs gladly fall or better, SLIDE off our backs, but there was no gravity involved with their effortless flinging of the pack. And there was no discernible THUMP when they took them off and they fell to the shelter floor. Cracked me up, but they missed the spirit – they were not feeling nor portraying the thrill of carrying your life on your back, one foot in front of the other, counting every precious ounce. Sorry they did not consult with the ATC for a reality check…. Bryson’s hike was in 96 not 98. A 10 % completion rate was more or less correct for that time and no, there were no cellphones on the trail (that I saw) other than the one I had. The movie had Mary Ellen singing modern songs so I assumed it was a recent time period compared to the book. A time when cell phones were definitely available. This could just be a plot whole though. At the motel, the sign says “Founded in 1931”, and she says they’ve been running it for 83 years, making the date in the movie 2014. As a lover of the outdoors, I naively read the book based on the title. I also become very angry at the author’s seeming distain for the AT, the outdoors, the mountain people, Christians and the experience as a whole. Then, I saw a young person reading this award winner. When I asked her opinion, she told me it was an awful read but mandatory in her academic challenge class. PS.. When hiking in VA 2 weeks ago I met 2 young thru-hikers and they were wonderful. I told them to google Badger!! And for clarification, I am not the ORIGINAL AWOL, I am v2.0. The near carbon copy of the person that wrote that original book that inspired me to hike it. They were way too clean. I am planning to hike the first half this spring and can already smell myself. Correct me if the AT is different, but every backpacking trip I’ve been on- from two days to a week- and any day hike over 15 miles, has left me rancid. This without solo carrying supplies to get me 1,100 miles. Until the end, Katz was the only character who was filthy. Mountains don’t care if you’re overweight or an olympian: they make you sweat! I’m so glad I’m not the only one who noticed this! I actually had to stop reading the book because I thought, this guy is a real jerk! Back in the mid 90s I was working at an outdoor store in NJ in the tent department. Over the course of several months every once in a while, maybe 4 or 5 times this guy came in, usually in the morning and asked me about tents and the Appalachian Trail. He always had on a tweed jacket, had bad breath and was more than a little rumpled. Over the course of a couple of months he would occasionally appear and ask more questions. Always polite and intelligent he gradually began to get on my nerves because He never bought anything. He would stay for an hour or so each time and then just leave. And then I never saw him again until I was reading A Walk in the Woods one day a few years later. Imagine my surprise when I looked at the back cover at the picture of Mr. Bryson and realized that he had been the one to visit me all those times. And did I get a mention or a thank you for the hundreds of questions I answered? Nope. And another friend of mine who has forgotten more about the AT than I will ever know says Katz does not exist. He says that he is a literary creation used to further the story but that he really never existed. Stephen Katz existed but has a different name. He was in one of Bryson’s earlier books, “Neither Here Nor there”. Bryson lives in Hanover, NH, why would he have been visiting you in at Campmor in NJ on a regular basis? To be fair I met a Southbounder at fontana damn and another a couple of months later. They did most of it and then weren’t able to finish they were mopping up the last couple of hundred miles. No, not accurate, but definitely funny. Bill Bryson is one of my favourite writers. His books are always one part hilarious story, one part history. While not always an accurate depiction, I think a Walk in the Woods does one amazing thing for the trail; it brings awareness to the existence and protection of this important resource to a whole host of people who may not ever step foot on the trail. Increased interest means more hikers, more donations, more representation in politics. Shortly before the scene filmed at McAfee Knob, Bryson and Katz view a map showing them in Northern Virginia, roughly in the same area as Bears Den in Bluemont. While I have never been to McAfee Knob, both the rocky outcrop and vista shown in the film seem to be quite similar to those at Bears Den. Considering that this is a film, and that films are rarely ever accurate in every detail, could not one interpret them as being at Bears Den instead? It seems like the film gives a decent portrayal of two people who really weren’t prepared or even had the actual desire to do it. Scenery aside, you can find a semi-difficult trail to hike and just go around in circles until you’ve walked 2000 miles. You will experience most of the same misery that goes into walking endlessly and camping way longer than anyone who’s not homeless should, for no good reason other than to say you did. You people need to lighten up. It’s a great movie from a great book about a great place. For a movie, it’s more accurate than most and the small inaccuracies do not detract from the real AT. Bryson hiked the trail in 1998. He was born in 1951. If he had been married for 40 years as indicated in the movie, he’d be improbably young on his wedding date. I started overnight hiking a bit late at age 52. Read Bryson’s book ~ August 2000 in which he claimed to head off to Georgia having never spent a night in the woods, only day hikes. Didn’t quite believe that. Who would start start out on 2200 miles without a short few nights on a trail first? He lived in Hanover, could have walked up the trail a few miles and spent the night. A few days going north from his house he could have gone over Mt Moosilauke. Although I didn’t know much about the AT before reading the book, I learned a lot of historical facts about it from the book, which I enjoyed learning. His personal story had lots of internal inconsistencies, like claiming he was trying to do the whole thing, but only had about 2 months available. This after telling us in the intro that 4 months was about record time for a good hiker. Even on first reading, I realized I was reading what was mostly a novel, not a documentary. The only thing that bothered me a lot was that he claimed decorating the side of the trail with discarded equipment was a common practice. Even with my limited experience I knew this was totally “fake news”. In spite of that I enjoyed the book, have read it again about 5 or 6 times, after actually completing the trail myself, and given copies away to 3 different people. After reading the book, I decided if a novice with absolutely no experience was willing to try the AT, I could at least try doing the much shorter “Long Trail” (~275miles) in VT. Which I did summer of 2001. I didn’t even want to think about the AT at the time, but began thinking about it about 5 minutes after I reached the Canadian border. $ years later (at 58) I retired, and got on a plane for Georgia. After ~1100 miles I had to quit with an injury, but came back a year later and finished. My point was, this “bad” (inaccurate, misleading) book actually challenged me to get into long distance thru hiking. Can’t say I liked the movie at all, however. ps1: Scotty-2-lite – Doing the Long Trial in 2001, I started out with a 52 pound pack, Half way through, after much advice from seasoned hikers, I left for a week, bought a Go-Lite, and got back on the trail with 18 pounds “base weight”. I show up 4 years later on top of Springer Mt with the same gear, except with a tarp instead of a tent. After several days you tend to group up a bit with people doing about the same pace, in my case with “Pockets” and “Study break”, and later with “Skywalker”, Bill Walker who wrote the book that is listed in the ATC library. Pockets had a 50 pound pack and insisted I was “Too Light”. And that became my trail name in the ATC record (of completions). ps2: Even though I got to Georgia 9 years after Bryson (and about 14 years older) by chance I hired the same shuttle driver, Wes Wisson, to drive me from Atlanta to Amicalola Falls, a 2 hour ride, during which I asked him a lot about Bryson. As Bryson says in the book, Wes had a lot to say. Katz, who’s real name he told me, but I’ve since forgotten, looked, he said, much more fit than the character described in the book. Wes said the same about Bryson. Like many people I met in Georgia, Wes didn’t think Bryson hiked nearly as much as the 700 miles he claimed in the book. I heard low guesses at around 50 miles but the truth is probably somewhere in between. Although I had many interesting experiences in doing 2200 miles, I had no where as many strange ones as Bryson claimed in his 50 or 700 miles. What I think is he included many stories he heard, and wrote them in the 1st person, which makes them much more interesting. But probably, when he heard them, they’d already been exaggerated.